Why are girls beautiful until they’re stronger than you? This poem is by author Sarah Lilley, addressing the growing case against the enforcement of gender roles. The author sends a clear message that she does not agree with the stereotypes that are placed upon women to submit to men as the more dominant gender. The poem is written in the form of a sonnet (abab cdcd efef gg) to create a rhyme scheme that fits her poem. The poem’s tone is very judging, almost challenging the reader to contradict the idea. To prove that what she’s stating is wrong. In line 10 it states “your sympathy is less than treacle” meaning that unless you, the reader, make a stand for equality among genders your sympathy will not make a difference. A metaphor is used in lines 5-6 comparing the woman’s IQ to a mountain that she’s being forced to climb. This means that society has placed many obstacles in front of her goals that she must overcome before moving forward, like a mountain for instance. She must “climb” a difficult mountain of social hierarchy before she’s able to reach her goals as a woman. No matter how smart she may be, it does not matter to people who believe there’s a man just as capable. The theme of the poem is very feminist. It addresses the underlying problems that our society has placed on the backs of women to carry. 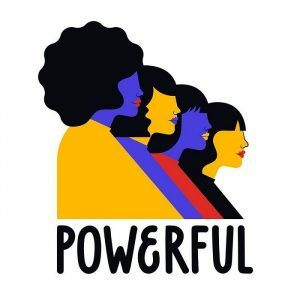 It’s made it that much more difficult to get a woman to the same level as a man in the work force because “in order to be an overflowing fountain you make her struggle for every dime”(line 8). Women are not able to reach their full potential unless they are treated with the same respect as men. Arithmetic sequences are a group of numbers (i.e. 4, 9, 14, 19, 24…) that increase by a steady amount. In this case 5. Using the equation we can find any number within the sequence, with representing the unknown number, represents the first number in the sequence, represents the difference between numbers, and being the number we’re trying to find. The plugged in equation would look like which in turn is . With this equation you can implement any number of the sequence into the equation to find it’s value. If we factor a quadratic equation, we can find the roots, as well as the axis of symmetry. With this information, we can draw a quick graph depicting what our parabola would look like. graphing the equation with only the factored form won’t give us a complete parabola, but it will give us enough information to get a rough idea. replace the “y” with 0.
with the x-intercepts, we know that when graphed will be in the format (x,y). But since the x-intercept is where the parabola crosses the x-axis, the y-intercept will equal 0. The x-intercepts will be (-5,0) and (2,0). 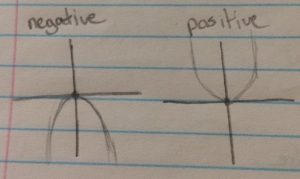 The axis of symmetry is half way between both roots, so the AOS will be x=-1.5. 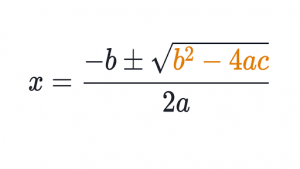 if you have a quadratic equation (equation equal to zero with 3 distinct parts), you can use the quadratic formula to solve. Depending on the answer, we can figure out whether the equation will have 1,2 or 0 solutions. With a quadratic equation in the format we can substitute the a, b and c values into the discriminant equation to find out how many roots. 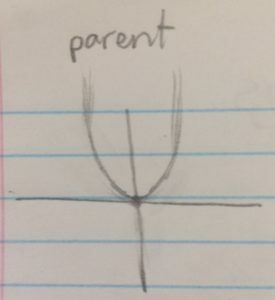 Graphs of quadratic functions all have the same shape which we call parabola, that can be graphed to give us information such as the roots, y-intercept, axis of symmetry, etc. In order to find this, we have to first graph it using some of these easy tricks. Sine and Cosine Law are used to solve for angles and sides of a triangle that isn’t a right triangle. Sine Law is used when you’re able to use the formula . In order to use the formula you must have all values of one fraction, and half of 1 other. This way, you can solve for an angle/side you’re missing. It can be any part of the formula, as long as one + half of another is given. 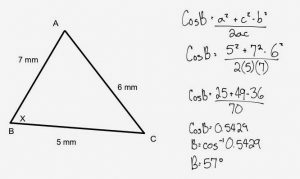 Cosine law is used when two sides and one angle are given to you, but you’re trying to find the missing side. The formula used is for finding a side, or . 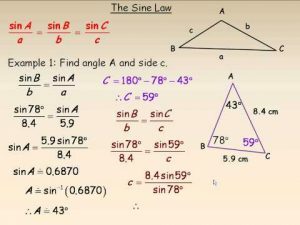 This week we learned how to use Sine Law and Cosine Law to find the angles and sides of triangles that aren’t right angles. 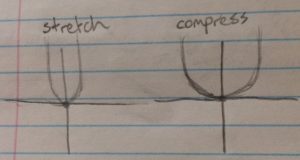 This week we spent some time reviewing trigonometry from grade 10, so that we would be refreshed for our trigonometry unit this year. SohCahToa is used to find angles of right triangles. For example: H=8, O=4. Find angle x. 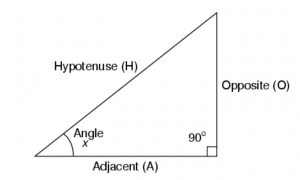 This diagram labels the hypotenuse, opposite and adjacent, but not all diagrams are labeled. Too figure out which is which is easy! Hypotenuse will always be your longest side, and is usually straight across from your right angle. Adjacent is the side directly connecting your right angle and missing angle. Opposite is the side leftover or directly across from the missing angle. In our abbreviation Soh Cah Toa: “S” stands for Sine, “C” stands for Cosine and “T” stands for Tangent. Other than these, your smaller letters all stand for something: Your “o”pposite, “h”ypotenuse and “a”djacent. Knowing where each side is can help us dictate whether to use Sine, Cosine or Tangent to solve for the angle. 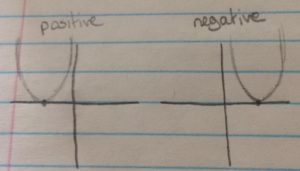 In our diagram, we’re given the length of the hypotenuse and the opposite. Knowing that we decide to use “Soh” from our abbreviation because it’s the only one with opposite and hypotenuse. To find the angle we use the “sin” button on our calculator, but the inverse function of it because we’re solving for the angle and not a side. If you were instead solving for a side, the regular “sin” button would be used instead.